In this guide, we’re going to show you how you can set up Alluc, which is a provider of sources for Movies and TV Shows with the Covenant Add-on for Kodi Krypton. By adding Alluc to Covenant, you will receive a lot more sources in your list, most in HD too. Although the compression can be quite large at times. Now that we have set up Covenant, you can already start watching content. However as of late, a lot of streams have disappeared and stopped working in these Kodi add-ons. To sort of aid this, it’s time to implement Alluc. Head over to the Alluc Accounts area, and press ‘Sign up‘ at the bottom. You’ll need to input a Username, Email and Password. Once you’ve completed this, you may need to activate the account by clicking the link in your email. Next, log in to Alluc. On your profile, one of the boxes will contain an ‘API Key’. If you’re on a Computer, you can just copy it. However if you’re using a Fire Stick or other external device, you’ll need to type the code letter by letter unfortunately. In Kodi, head into the Context menu of Covenant. You can do this by pressing C on your keyboard, or just a menu button on the remote control when hovering over the addon. Open the add-on settings. 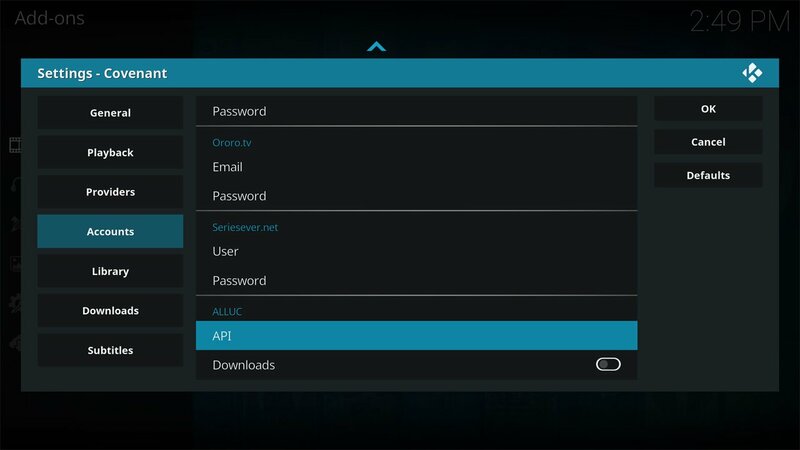 On the right hand side of the Kodi Covenant add-on, look for “Accounts”. At the very bottom, you will see Alluc. In the text box next to API, enter the key from your account settings on the Alluc website. Press OK once you’ve inputted the key and you’re done! When you choose a Movie or TV Show in Covenant, you will see a lot more sources. Alluc sources are very reliable and of a good quality, so always check them out! Hopefully this guide helped you. You can check out our Kodi Add-ons and Kodi Builds for more great content. is valid what you say above for android TVbox BeeLink GT1. Because , I performed above and got good result…..OK. But , BeeLink GT1 TvBox I could’n get the good result.